The JCB Teletruk is not just another lift truck. The range covers the most popular 2.5t – 3.5t capacity bands; diesel-powered two-wheel drive or four-wheel-drive, and two-wheel drive gas models. Teletruks are true industrial counterbalanced machines. Because there’s no vertical mast in front of the cab, when the job calls for container loading you won’t have to suffer the expense of a special container mast. With a JCB Teletruk full ‘Free Lift’is exactly that; it comes free as standard. 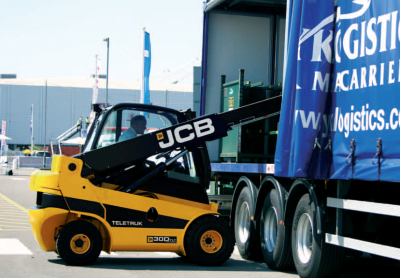 The JCB Teletruk – it’s not just another lift truck.